A monster that battles with this Defense Position card is returned to the top of the owner's Deck at the end of the Defense Step. The last time we reviewed this card I said he’d be best in a Chain Energy Deck, because where Bounce is good, returning to the top of your opponent’s deck is even better. I stand by that. With 1300 ATK for a Level 3, LJM can attack for a fair amount under Level Limit and Gravity Bind. He can also take out Marauding Captain (recently unsemirestricted). 1800 DEF allows him to stand up to a lot, though of course not everything – but the rentsy part is that if anything attacks him while he’s in DEF, it’ll be bounced to the top of its owner’s deck. That means if your opponent is unfortunate enough to attack this guy with something like Jinzo or (hey, why not) Serpent Night Dragon, not only will he have to tribute monsters again to summon it – he’ll have to draw the card again on his next turn, preventing him from drawing what he would’ve drawn. It’s good card advantage. This guy can just be sick. He's one of the best opening turn sets in the game. The only thing as important as building your own advantage is removing advantage your opponent has, and this guy does it in spades. If an opponent sends an 1800 or less monster into this, they end up with a -2; they lose their monster from their field, and lose their next turn draw as they're stuck getting the same thing back. If your opponent sends something stronger into this, they end up with a -1; you lose your Jujitsu Master, and your opponent loses the above-mentioned things. If the monster they attacked this with was a Tribute monster, they are hurt even more as they get stuck with a monster in hand they have to spend another resource to summon again. 1. 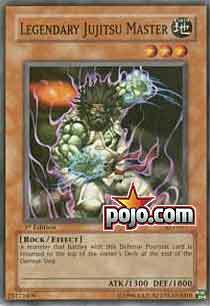 Drillroid owns this card -- and as HE was ALSO seen in the Top 8 Shonen decks, people will be using him as an all-purpose counter that not only takes out Reapers and set DDAs but this as well. 2. Mystic Swordsman lv. 2 can be RotA'd from the deck and wreck your LJM. But seriously, 1 of this guy might be a really great move depending on your metagame. Coin Flip Legendary Jujitsu Master is both awesome and sucktacular all at once. I have bad experience with him. I can't deny that. When I use him, and when I see people using him, it's usually a Breaker that gets bounced. I don't know if I taint LJM with my presence, but LJM has not earned my trust. Of course, I'd be a crappy reviewer if my reviews couldn't bypass my own personal opinion. If this thing is destroyed as a result of battle, you still don't lose advantage. In fact, if anything, you gain advantage. The cost of a summon according to Ultimate Offering is 500 LP, but the cost of it in an aggro-heavy metagame might be 2000 LP or more. Losing your summon is monumental. It leaves you without the opportunity to defend yourself or perform an offensive maneuver. Bounce is dangerous. They lose their draw phase and a summon just by attacking this card. Their reasons for doing so had better be good, eh? Of course, this thing isn't the most powerful card to use in the new format, but that shouldn't stop you from trying it. dawnyoshi There’s not a lot that I have to say about Legendary Jujitsu master. It’s an amazing defensive play. Jae LOVES this card. If your opponent destroys this card as a result of battle, then it’s a one for one trade-off that screws with the opponent’s draws. If the opponent attacks this card with a D. D. Assailant, then they’re obviously in a world of hurt. What else can I say? Spinning effects are ridiculous! In traditional, it’s called Raigeki, Dark Hole, hand destruction, Change of Heart, Magical Scientist...yeah. You’ll never get this ability off. Oh, and this is a top pick in limited. Obviously removal that can mess with your opponent’s consistency is ridiculously powerful. This punishes the opponent for tribute summoning monsters. Dark Paladin Legendary Jujitsu Master is a very interesting card, and one I have a particular liking for. He is Earth, and Rock, which gives him a place there. 1300 attack isn't great, but it isn't bad for his level. 1800 defense is fairly powerful, only beatdown can crush it generally. The effect is what shines here, when attacked while in defense posistion, LJM returns the attacking monster to the top of your opponent's deck. In a word, that is sweetness. If something too weak attacks LJM, it is returned to the top of the deck. Then, your opponent either a) gives up ANOTHER monster just to get rid of him, or b) uses Monster Removal of some sort to rid the field of him. Art: 3.5/5 I like it, the Jolly Green Giant perhpas?